Today our new coloring books arrived and I can't wait to tell you all about them! We have collaborated with artist Matthew Alderman to use his incredible artwork in not one, but two coloring books! Each book features 23 illustrations ranging in coloring difficulty from beginner to whoa! The first of these, Feasts of Our Lord and Our Lady, is largely composed of a group of illustrations Matthew was commissioned to create for the 2011 Revised Roman Missal, published by Liturgy Training Publications. These depict the various seasons of the Church Year, as well as the life of Our Lord. 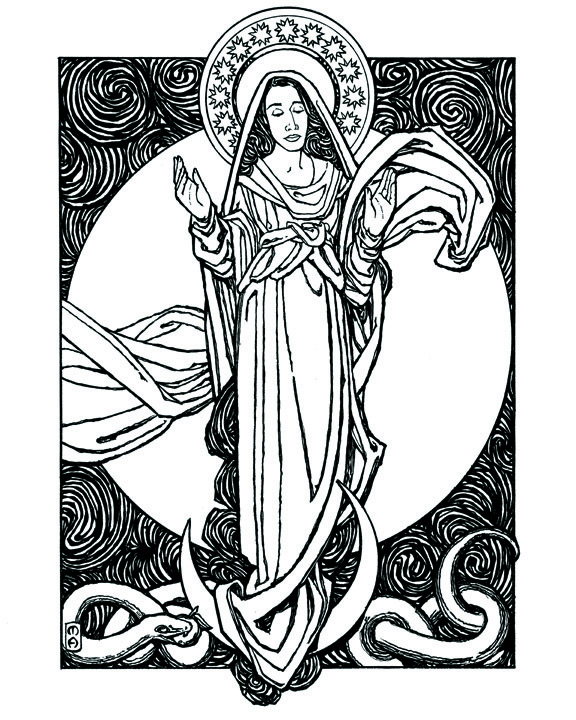 We have also included here some of Matthew’s images of Our Lady and her various titles. ...And there are many stops in between! Short bios are also provided for each saint. We gave this book its name because you will be feasting your eyes on every one of these works of art. The complexity of most of the illustrations in both collections leads us to recommend these for slightly older children (they may be too much for the younger ones) but teens and even adults are likely to get a great deal of enjoyment from these, and the finished product will likely be suitable for framing. We hope you will agree that these coloring books are one-of-a-kind!